VATICAN CITY (CNS) — A heart hardened by anger and resentment is worse than eating humble pie and reaching out to enemies to seek peace, Pope Francis said. “Worse than trying to build a bridge (of understanding) with an adversary is to let the heart swell with rancor toward him,” he said Jan. 24 during his early morning Mass in the Domus Sanctae Marthae, where he lives. 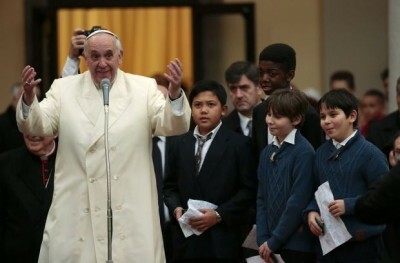 Holding onto one’s hatred and anger, instead of taking the first step toward peace, only renders people “isolated in this bitter broth of our resentment,” he said, according to Vatican Radio. When someone is wronged or faces an enemy, one option might be retaliation or revenge, Pope Francis said. But the Christian response is to choose the path of dialogue, he said, which requires humility, meekness and becoming all things to all people. One thing the Bible doesn’t mention is that “to do all this, you need to swallow a lot of ‘toads,'” that is, the bitter pill of humiliation, he said. “But we have to do it because that’s how peace is made — with humility, humiliation, always trying to see the face of God in the other,” he said. Taking the first step toward dialogue and stooping low to begin building a bridge of understanding is not easy, he said. The longer an argument or misunderstanding is left brewing, the harder it is to resolve “because over time the wall grows higher like weeds that choke off the grain,” he said. It is better to build bridges than walls, the pope said, “because even our heart can become like the Berlin Wall” shutting off others. The pope’s homily Jan. 24 was a continuation of his Jan. 23 homily — both were based on the days’ readings from the First Book of Samuel, which describe the conflict between King Saul and David. What should have been a time of joy over David’s victory against Goliath, King Saul instead was steeped in envy and hatched a plan of murder because of the amount of praise David received, Pope Francis said. Jealousy “is a strong poison” that divides communities and families like Cain against Abel, he said. In his Jan. 23 homily, which took place during the Jan. 18-25 Week of Prayer for Christian Unity, the pope asked for prayers for all Christian communities — that they be spared of people sowing the seeds of jealousy.